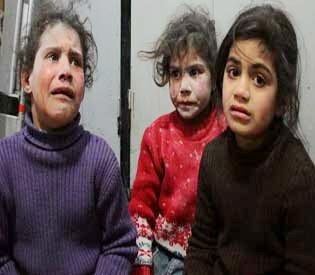 The UN children’s fund on Tuesday expressed “outrage” over the killings of children in Syria by issuing a blank statement, adding in a footnote that “no words will do (them) justice”. The statement came after a ferocious Syrian regime bombing campaign pounded the rebel-held enclave of Eastern Ghouta on Monday, killing 127 civilians, 39 of them children. “No words will do justice to the children killed, their mothers, their fathers and their loved ones,” said Geert Cappelaere, UNICEF regional director for the Middle East and North Africa. Those words were followed by a blank page. The United Nations on Monday demanded an end to the targeting of civilians in Syria. But on Tuesday, the Syrian Observatory for Human Rights war monitor said at least 50 civilians, including 13 children, were killed in a second day of air strikes on Eastern Ghouta. Held by rebels since 2012, Eastern Ghouta is the last pocket of opposition-held territory around Damascus and the regime of President Bashar al-Assad appears to be preparing a ground assault to retake it.